In the character of this beautiful home, the double en suite bedroom has an antique double bed and huge roll-top free-standing bath (a honeymoon hideaway! ); there is a comfortable twin room with its own bathroom; and a family wing. Jo is a good cook and has a reputation for her delicious traditional breakfasts, served usually in a sunny, flower-filled conservatory. The fishman arrives each week with kippers and smoked haddock, while most fruits and vegetables come out of the garden including the free-range eggs! Dinner is arranged with prior notice. Muddy boots welcome! 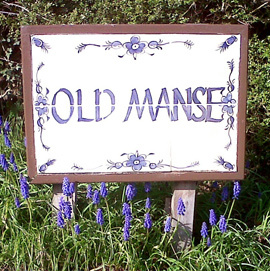 The Old Manse is located close to the West Highland Way and Ben Lomond and also Cycle Route 7, enabling you to cycle or walk safely for miles into Loch Lomond National Park and the Trossachs. It is great fun to take bikes with a picnic on a 19th Century steamship across the stunning Loch Katrine and cycle 14 miles back to the pier. Gartmore is very central: 20 mins from Loch Lomond, 30 mins from Stirling, 50 mins from both Glasgow and Edinburgh Airports. 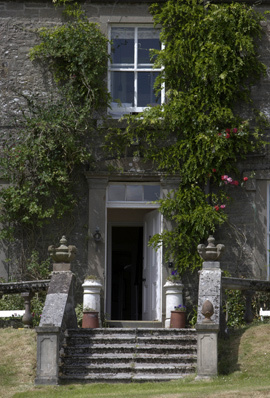 “The Old Manse is a jewel in the B&B crown. Jo and Anthony are accomplished hosts and the food, much of which is homemade or homegrown, was the best we have had in any B&B. Jo cooked us an exceptionally tasty evening meal which was most welcome after a day on Ben Lomond. The building is beautiful and is packed with treasures collected by this very knowledgeable couple. We look forward to a return visit and will certainly recommend The Old Manse to our friends“. Deborah B from Northumberland. With rooms starting as low as £40/45 per person per night, you are sure to find your stay to be a memorable and affordable one.